Srdja Popovic was one of the founders of the Serbian nonviolent resistance group Otpor! Otpor!’s campaign against Serbian president Slobodan Milosovic was successful in October 2000 when thousands of protestors took over the Serbian Parliament. After the revolution, Popovic served a term as a member of the Serbian National Assembly. In 2003, Popovic and others started the Centre for Applied Nonviolent Action and Strategies (CANVAS). CANVAS has worked with activists from 46 different countries, including Zimbabwe, Burma, Iran, and Venezuela, spreading knowledge of the nonviolent strategies and tactics used by Otpor! 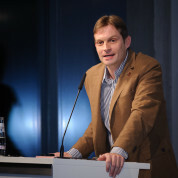 In November 2011, Foreign Policy Magazine listed Srdja Popovic as one of the “Top 100 Global Thinkers” of 2011 for inspiring the Arab Spring protesters. In 2012 he was nominated for the Nobel Peace Prize. In 2014 he was listed as a “Young Global Leader”. "With this wonderful book, Srdja Popovic is inspiring ordinary people facing injustice and oppression to use this toolkit to challenge their oppressors and create something much better. When I was growing up, we dreamed that young people could bring down those who misused their power and create a more just and democratic society. For Srdja Popovic, living in Belgrade in 1998, this same dream was potentially a much more dangerous idea. But with an extraordinarily courageous group of students that formed Otpor!, Srdja used imagination, invention, cunning, and lots of humor to create a movement that not only succeeded in toppling the brutal dictator Slobodan Milošević but has become a blueprint for nonviolent revolution around the world. Srdja rules! "